Trust, the feeling of safety within your relationship, is one of the most crucial components to a healthy relationship. Unfortunately, trust can easily be broken. Whether you were unfaithful, lied, or crossed a boundary in your romantic relationship, the trust your partner once had for you has been altered. Breaking the trust in your relationship leaves your partner feeling betrayed, insecure, hurt, and angry. While you may want everything to blow over and be fixed within a few days, trust doesn’t come back that quickly. Regaining trust from your partner who is feeling hurt and betrayed takes a lot of time, commitment, and patience. While you may have said “I’m sorry” a million times, your partner is going to need a lot of evidence that you are serious, reliable, and safe enough to love before they trust you again. 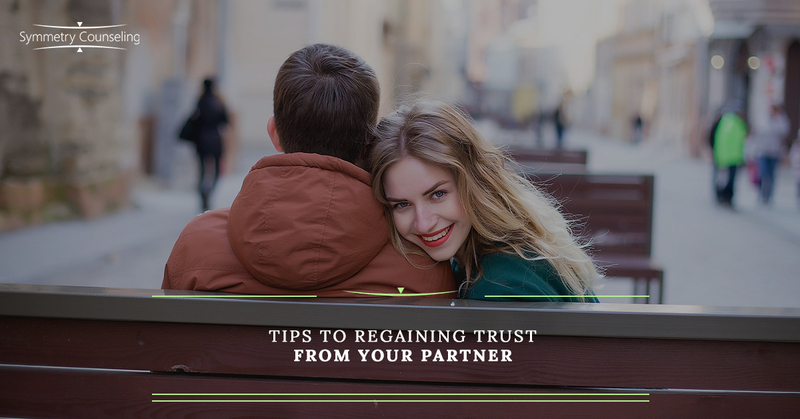 Below are a few tips that may help to regain trust from your partner and hopefully come out of this as a stronger couple than before. While your partner has caught you in a lie or an act of infidelity, they may not have the full story. Rather than keeping secrets try being as open and honest as you can early on about the details so the wound does not get reopened later. Make sure to give them the time and space to ask you questions, gain clarity, and share their feelings throughout this process as well. As long as you are both open and honest with how this has affected you and the relationship, you are already on the path towards recovery. Not only should you be open and honest with your partner but you must also take full responsibility for your actions. This includes not only verbally stating your part in the affair, but also taking a look into why the lies or cheating occurred in the first place. Where are your needs not getting met? Are you feeling bored or unhappy in your relationship in some way? Doing this will help both you and your partner understand how/why this happened and how to prevent it from happening again in the future. The initial shock of the betrayal of trust is over but the hurt may continue for weeks or even months. They may ask more questions than usual when you go out with friends, need to know who you are with, feel the urge to look through your phone or see something that sets them off. Embrace these moments with patience, compassion, and empathy even if it is months later. Continue to be patient with your partner and attempt to understand where they are coming from: doing so builds trust over time. It is common for your needs to be neglected for some time after trust has been broken, and this may be frustrating at times. However, now is the time to focus on your partner’s needs. Make sure to make a daily effort to show them you love and appreciate them in any way you can think of. If you know your partner’s “love language”, you can try doing more of those things for them so they feel appreciated by you. Continuing to show love and support to your partner even when they feel angry and betrayed shows your commitment and loyalty to them. Over time, your needs will begin to be met as well, but this naturally takes some time for your partner to become comfortable with. Practice patience and over time you will begin to see glimpses of trust coming back between you and your partner. If you are currently working on regaining trust with your partner would like some support, it may be useful to connect with a therapist. Contact Symmetry Counseling at 312-578-9990 to set up an appointment with one of our very skilled therapists today!